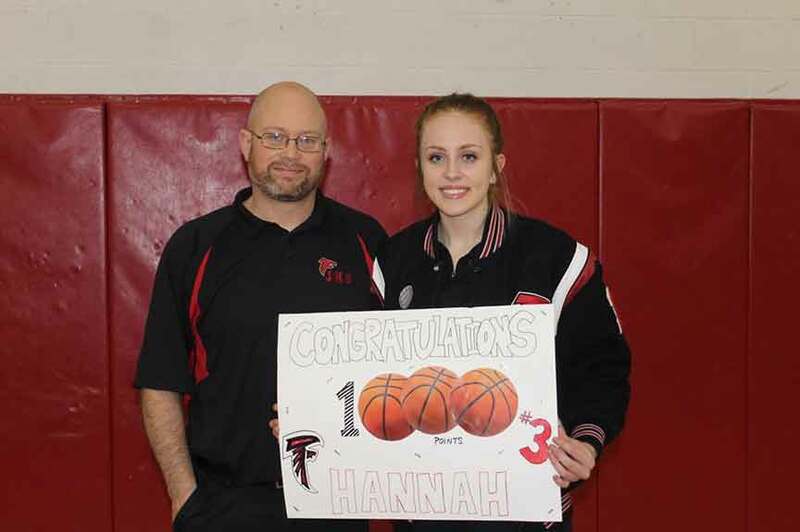 Hannah Root, of Jefferson, became the seventh Falcons player to score 1,000 points in her high-school career last week. Root joins former Jefferson Falcons players Shellie Crandall, Anita Jurcenko, Kelly Kapferer, Bekki Hamper, Haley Kapferer and Emily Smock to reach 1,000 points in her career. “I didn’t really start thinking of it (1,000 career points) until the end of my junior year. I knew I had to have a good year and then a good senior year,” Root said on the possibility of reaching the milestone. Root was able to score her 1,000th point in a recent home game against Struthers. The Falcons fell in the game 57-46 but played well in the second half. Root finished the game with 21 points, including 13 in the second half. “It means a lot to me because the other players who have scored 1,000 points are obviously really good, so to be compared to them means a lot,” Root said. Root actually started her first varsity game the same night that former Falcons stand-out Emily Smock scored her 1,000th point. Root also had heard stories of the Kapferer sisters and their success. “It kind of made me want to achieve it more. I thought if she could do it, I could, too. It made it more realistic,” Root said on witnessing Smock reach 1,000 points. Like a lot of players closing in on a career milestone, Root had her challenges. She had scored double digits in 33 straight games dating back to the end of her junior season. Heading into a recent game against Niles, Root was 27 points away and was held to only eight points. She then scored 11 in a game against Girard to put her at 992 points. Root went into the game needing eight points and admitted she was a little nervous. “I was kind of nervous, but once I scored 1,000, I felt like the weight had been lifted. After I scored 1,000, I wasn’t nervous at all and didn’t really think about it anymore,” Root said on how she felt heading into the game against Struthers. Root scored her first two points of the night on a pair of free throws. She then made a pair of baskets to get to 998 points. In the second quarter she was able to hit a shot near the free-throw line to get to 1,000. The achievement was announced during the next break in the action when a foul was called. “It was special because most of my family was there,” Root said. In her first season for the Falcons, Root scored 111 points. She went on to average 11.7 points in her sophomore season and was able to hit 43 three-pointers. Root averaged 15.4 points during her junior season and was able to connect on 42 three-pointers. Root currently owns the Falcons record for most three-pointers with 121 so far. “Obviously, I couldn’t have done it without all of my teammates throughout the years, and my coaches, too,” Root said. The Falcons have six games remaining before tournament play. “The goal is to win as many games as we can,” Root said on her goals for the rest of the season. Pictured: Hannah Root, of Jefferson, takes a picture with her father Jason Root after reaching 1,000 career points.